It’s raining today! The first time in weeks, so what better opportunity is there to catch up on my blog? The geocaching reviewer has been chasing me to either carry out some maintenance on a few my caches or archive them. One of them (GCGQCR Söderåsen) was 50 km to the west of us at the top of a hill that, when it was placed in August 2003, had a view to the coast. Since then the trees have grown and there is no view. There are no other caches nearby so the number of visits is minimal – 81 finds in 15 years. The decision was easy – archive it. 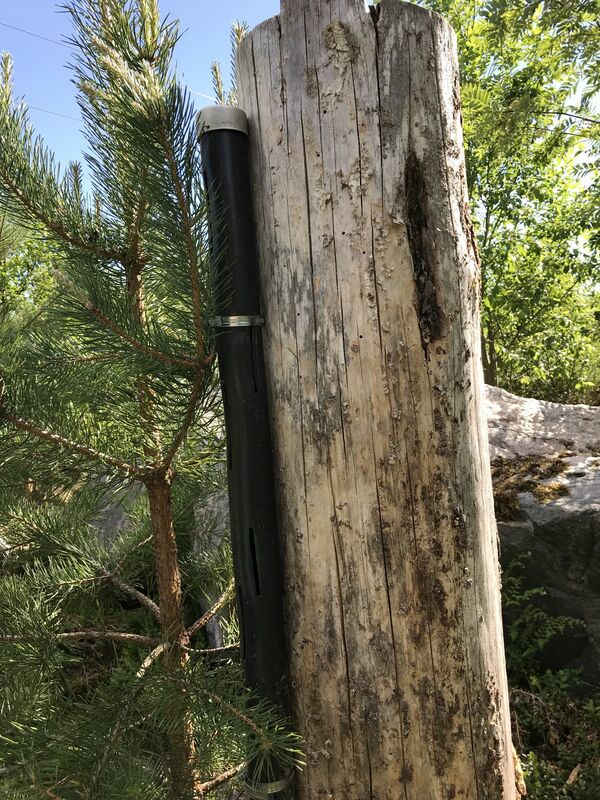 The other cache that was 50 km away, this time to the south (GC1VZ5T Vegavallen) was easy to get to and has had nearly 300 visitors in the nine years it has been there. We were invited to friends’ wedding in Tierp, the home of Vegavallen, so it was very convenient for me to replace the cache at the same time. The next closest cache that needed some attention was GC1W8HM Upptåget #1 – Gävle. The sign on the lampost that was the hiding place for the cache had been replaced and I guess the person who did the work threw the cache away. Anyway it was a moment’s work to place a new magnetic cache behind the new sign. Even though this is a boring micro it is one of the two remaining caches in the Upptagået series with 567 finds in nine years putting it some way behind GC1X8J6 Upptåget #13 – Uppsala which has had 923 finds in the same time. The closest cache that needed maintenance was one of the last few caches that I have placed GC5BFZ3 Hemlingby Trail #11 – Dunk. Even though it has only been found 35 times in 30 months it has 12 favourite points. In this case the cache was in excellent condition but the tree stump it was attached to had fallen over. It’s a 20 miute walk to the cache from the car park and I needed my cordless screwdriver with me to be able to remove the cache from the now horizontal stump and move it to a nearby vertical stump. The new stump is in much better condition and in the three plus years since the cache was placed this very exposed place, which is the reason it didn’t get placed there originally, has disappeared amongst new bushes. It’s still easy to get to but not obvious from the path. I had to update the coords somewhat due to the move but that was quickly done. Now, I just need to find the motivation to get the handful of gadget caches in my garage placed out somewhere in the world. Let’s hope the rain stops soon.